Overpriced hot dogs, over-salted peanuts, over-cheesed nachos and other unhealthy, greasy staples of every stadium across the nation which generally only appeal to us as impulse buys, will now be available to football fans without even leaving their seats. That’s right, welcome to the 21st century: Stadium snacks are now premeditated, or at least that’s how it is when you attend a private university in LA. With the help of Moccasio, a new business founded by for whom Henry West–a senior majoring in economics at USC–is a student advisor, stadium-goers can skip the long concession lines and just text their order without ever moving. After a payment is made over the phone, the order is received by a Moccasio worker (all USC students), and the grub can be picked up from any of the concession stands via a special texters-only line. Ha! Take that students without a texting plan! The only snag is that for many stadium seat potatoes (get it? Like couch potatoes?) 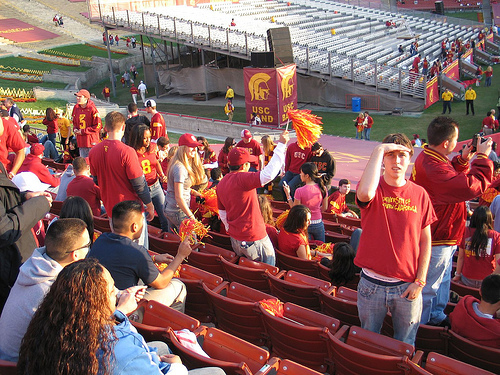 the USC stadium is a dead zone, and their order isn’t received until after the game is over. Although dining in while watching the game live is currently only a feature of the USC stadium student section, the student moguls have plans to expand, and we have a feeling we’re on that list. We’d like to think we wouldn’t stoop so low as to actually make a deliberate effort to seek out stadium munchies. We’ll walk the extra couple feet to maintain our snacking integrity, damnit.